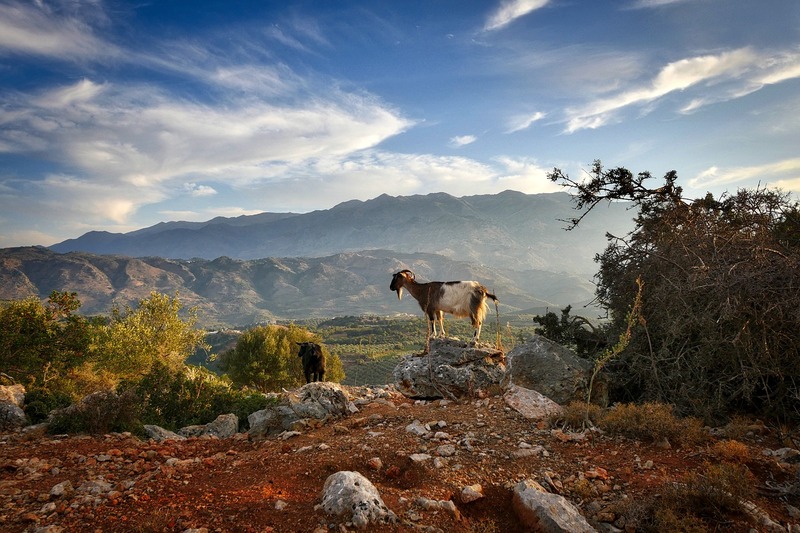 Greece's Sustainable Tourism: Which Way to the Future? Greek Tourism Minister Elena Kountoura with OECD Secretary General Angel Gurria and Secretary General for Tourism Policy and Development George Tziallas. The Greek Tourism Ministry and the Organization for Economic Co-operation and Development (OECD) just announced increased cooperation for developing best practices for optimizing Greece’s booming tourism. The question arises, however, as to whether or not Greek stakeholders who are line up alongside international tourism brands have the right focus. Here’s a look at what government and business have trained their sights on, and at important facets of sustainable tourism in Greece. According to the news from GTP, this new agreement came during a recent meeting in between Greek Tourism Minister Elena Kountoura and OECD Secretary-General Angel Gurriaat the OECD headquarters in Paris. At the meeting, the OECD official praised the effectiveness of Kountoura’s ministry’s efforts that are focused on sustainable tourism for Greece as a year-round destination. With sustainability having a big focus here on Crete, it seems appropriate here to make a couple of observations. First and foremost, despite the fact that Crete is the preferred destination for western Europeans, businesses here still suffer on account of low revenues. Secondly, there’s a sense here that big concerns have coerced their way into having an unbalanced influence on people’s and institutions’ understanding of what sustainability really entails. A case of news that may be misleading is one where the tourism ministry announced that Secretary-General for Tourism Policy and Development George Tziallas will represent Greece at OECD’s 102nd high-level tourism committee meeting that will take place October 30-31 in Paris. For those who do not know, OECD is an intergovernmental economic organization with 36 member countries, founded in 1961 to stimulate economic progress and world trade. The organization grew out of the Organization for European Economic Co-operation (OEEC), which was created to help administer the Marshall Plan, which funneled US dollars into Europe in order to gain access, influence, and control, rather than , . But this is another point of research. The European Union itself arose from these organizations founded mostly by the banking elites. What’s significant about OECD for my argument is illustrated in a meetup in between Angel Gurría, Secretary-General of the OECD, and Greece’s PR Alexis Tsipras, in Athens earlier this year to talk about Greece’s “recovery.” The short version here is, Gurría is basically the cheerleader of the IMF and the World Bank, the entities that along with Germany slammed Greece’s people to the pavement in the first place. Returning for the moment to Tziallis, news in September talked about efforts to strengthen cruise travel to Greece and promote new destinations. Tziallas met with sector decision-makers at the 12th Seatrade Cruise Med held recently in Lisbon, Portugal. During this event, Tziallis held meetings with the head of CLIA Europe and of the International Cruise Union Kyriakos Anastasiades, the managing director of TUI Cruises Wybcke Meier, the managing director of MSC Cruises Gianni Onorato and the chief of MedCruise, Airam Diaz Pastor. This brings me to a pointed observation. While Tziallis endeavors bear a positive connotation on the one hand, I am not sure that Greece creating the infrastructure to accept huge cruise liners is in the best interest of all concerned parties. 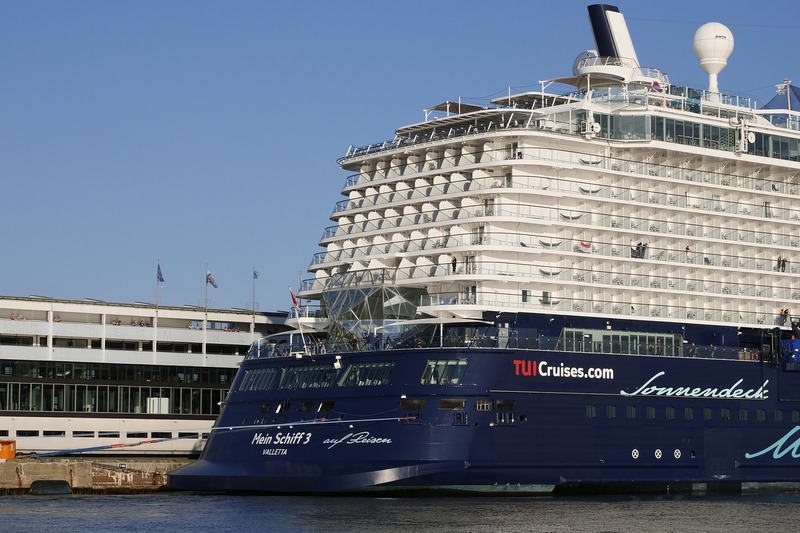 In these news reports, there is no mention of any study of environmental impacts or how big cruise ships will affect local businesses like those already negatively affected by the big tour companies like TUI. In short, larger cruise liners are in effect seagoing all-inclusive resorts. The question arises, “Does Greece need more budget tourists?” I know the answer for many smaller businesses and local villages is a pointed, no. I am equally sure that owners of the big AI resorts here on Crete will not be thrilled with mega-ships pulling into Heraklion or maybe even Rethymno. Tziallis’s presentation at the GNTO sponsored special event at Seatrade Cruise Med titled “Hidden Gems Uncovered: Opportunities in New Destinations, ” is that the ministry is more concerned with diverting tourists to a specific destination than affecting the structural problems Crete and other destinations face. 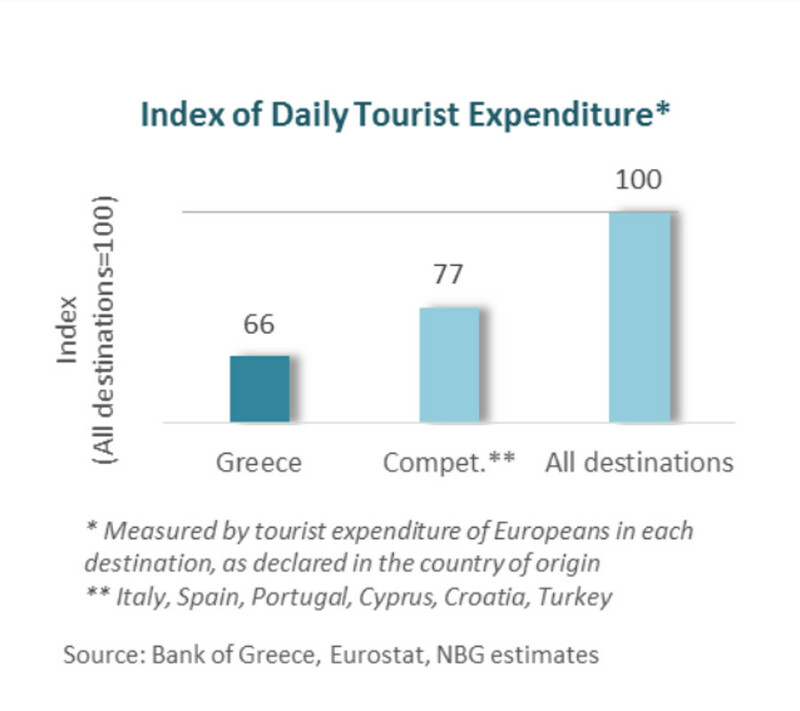 While an imbalance of visitation across the Greece market is a problem, the balance that’s hurting individual businesses and local economies is tourist spend. The fact is, high seasonality and low daily expenditure are murdering Greek business. The lost opportunities caused by big companies leveraging Greece’s economic situation appear to be creating a very dangerous domino effect. I’ll have more on this in a later report, but readers may want to read this National Bank of Greece study (PDF) on these subjects. 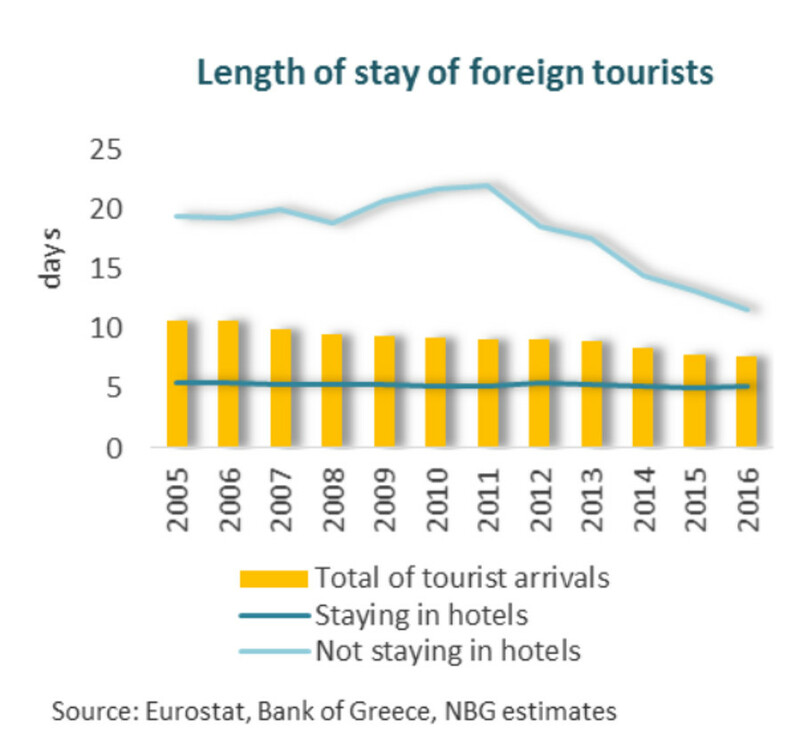 Bottom line, both the average daily expenditure and the length of stay of tourist arriving in Greece have nosedived in the last few years despite increased arrivals. This can mean only one thing. Of course, Airbnb factors into some of this as we find that length of stay has hit hotels hardest, with non-hotel stays remaining constant. (see chart above and below) An important bit of data in this report is the fact that small and medium-sized hotels are losing high-income guests, which are being replaced by middle-class travelers. Also, the room price for small hotels seems to have plummeted from an average of €112 euro per night to right around €100 euro as of 2016, while dynamic hotels’ room rates have skyrocketed to over €127 euro per night from €102. What I am driving at is that the Greek government and those backing the Tsipras play from other nations are not building anything like a sustainable future. Sprague goes on to validate my concerns over the GNTO’s moves to expand port facilities for larger cruise ships. The author discusses how these international conglomerates take advantage of labor, and how the trend is to create mega-vessels carrying thousands to cut costs even further. Readers with an interest in “real” sustainability versus corporate growth at any cost will be well served reading Sprague’s report here. As for my report, I believe I’ve presented enough evidence for stakeholders in Greece to begin asking the right questions. 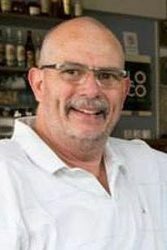 Many of the entities the GNTO and other key entities are presenting as “sustainable” are in fact questionable and economically, socially, and environmentally unsustainable trajectory, as Dr. Sprague and many others suggest. It is also important for the reader to understand that these international companies are becoming monopolies, whether or not European lawmakers address the fact. TUI is the best example I can think of, since the German company gobbles up hotels, cruise itineraries, packaged tours and flights, and so on. Next I’ll present real people and their opinions on the 2018 tourist season here on Crete. Stay tuned. 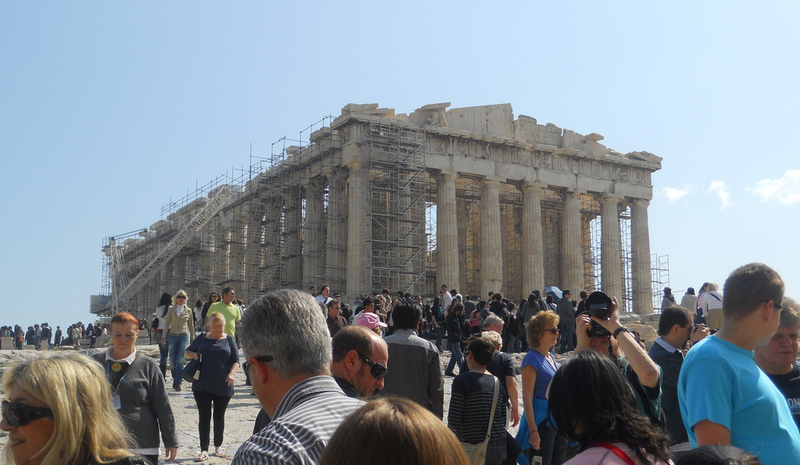 Next: Does Greece Have a “Mickey Mouse” Sustainable Tourism Policy?